A tongue-in-cheek guide to caring for your pet – dinosaur that is. Interactive reading experience with lift the flaps and diecuts. Fun for all dinosaur and pet lovers! Great discussion starter for families wanting a pet. For art teachers, this book demonstrates vibrant color choices, using collage, and paper engineering. Just about every youngster at one point or another desperately wants a pet. Little do people know that just like cats, dogs, and hamsters, dinosaurs make great pets, too! 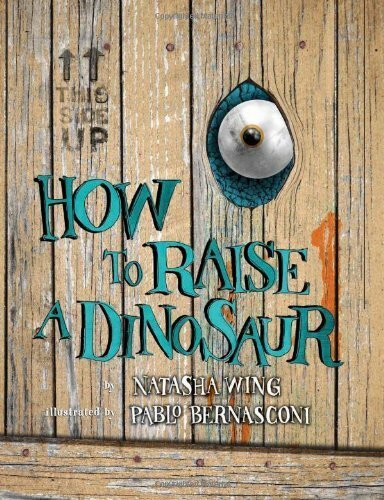 How to Raise a Dinosaur is a unique novelty book complete with a die-cut jacket, dino-bites, sturdy cardstock pages, and lift-the-flaps on every spread! Perfect for any dinosaur lover, it also serves as a way for children to understand the importance of caring for a pet. This book is "extinct" but still available online.